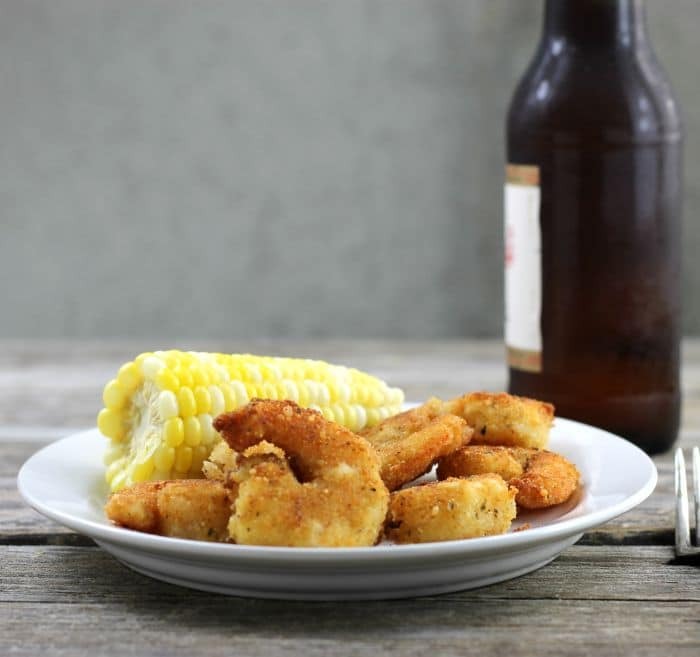 These crispy fried Parmesan shrimp use ingredients that you can probably find in your pantry today. This is a recipe that I will be making over and over again. I didn’t grow up eating shrimp on a regular basis. My parents would take us out to eat once or twice a year and it was always a treat to go to a restaurant and be able to order something we didn’t usually get at home. We would go to a little hole in the wall restaurant, but it had the best battered fried food you could imagine. My mom, siblings, and I would order the battered fried chicken, but my dad you would order the battered fried shrimp. He would usually share some of his shrimp with me and my siblings. 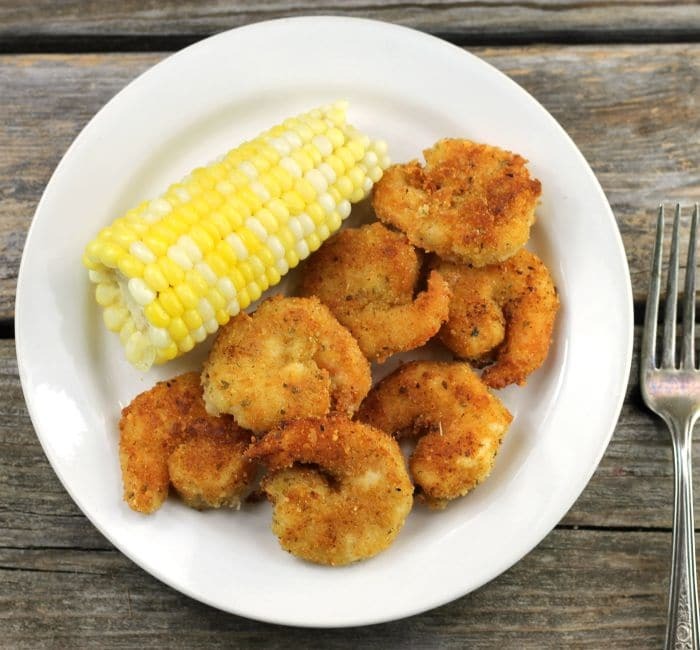 Growing up in the midwest shrimp wasn’t something that we ate at home. So it was a real treat when we got a sample of shrimp on our night out at that little hole in the wall restaurant. I know that most recipes call for panko bread crumbs when a recipe has a name that includes the words crispy or crunchy. But I use regular breadcrumbs for this recipe and the shrimp has a new crispy coating on it. I have used Plain and Italian breadcrumbs, both work really well for this recipe. I find that I like both equally as well. Start with a pound of cleaned shrimp. Set up your working station. One bowl for the flour mixture, one bowl for the eggs, and one for the breadcrumb and Parmesan cheese. Dredge the shrimp in the flour. Shake off excess flour. Next dip the shrimp in the egg. Coat the shrimp with the breadcrumb and Parmesan cheese mixture. Fry the shrimp until golden brown. Clean and devein one pound of large shrimp. Set up a working station. Dredge the shrimp in the flour. Shake off the excess flour. Dip the shrimp in the egg next. Then coat the shrimp with the breadcrumb Parmesan cheese mixture. Set the shrimp that are on a plate while completing the rest of the shrimp. You can work in batches doing these steps. While preparing the shrimp add about 1/8 inch of oil into a heavy skillet and heat over medium heat. Once the shrimp are coated and the oil is heated (I test the oil by dripping a couple of drops of water into it if it sizzles the oil is ready). Work in batches when frying the shrimp, do not overcrowd the skillet. Fry the shrimp 2 to 3 minutes on each side or until golden brown. (If the shrimp start to brown too quickly adjust the heat). 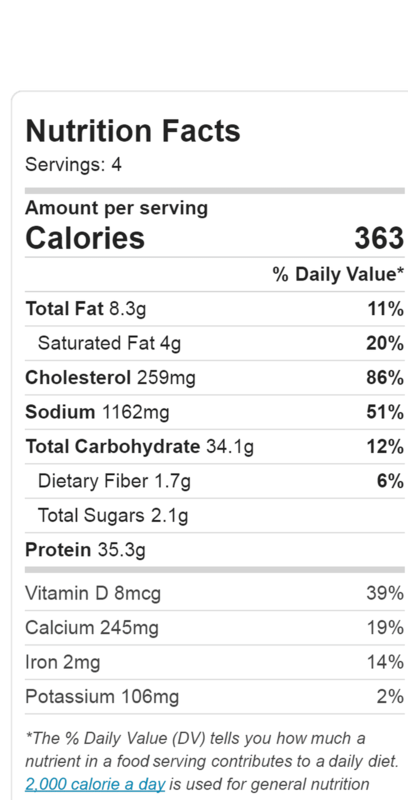 The oil is not counted in the calories. I could easily finish the whole plate! So tasty! Those are perfectly fried so crunchy and golden! Love that you added Parm to them – great flavor. 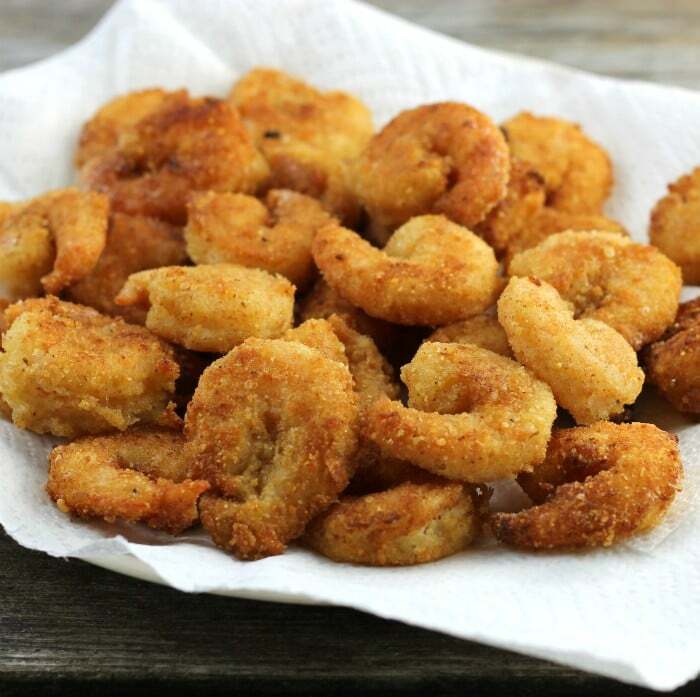 My mouth is watering – fried shrimp is one of my favorite things! 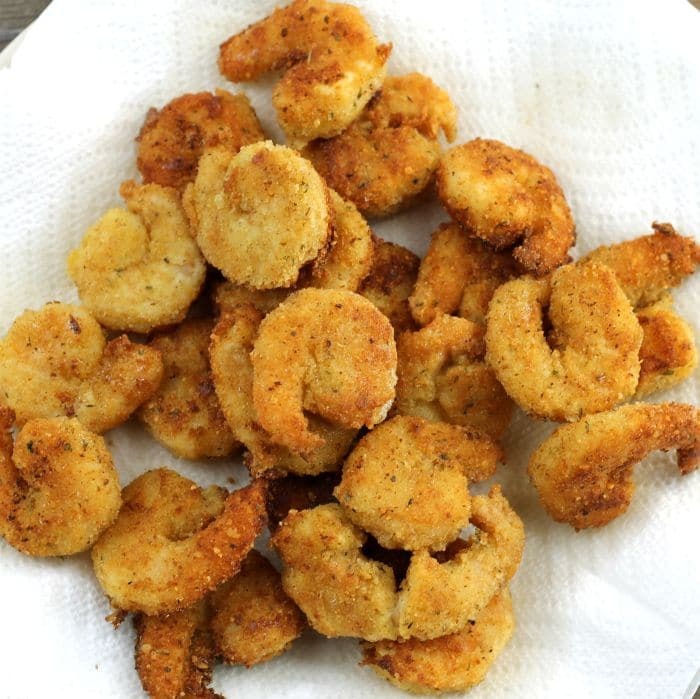 Fried seafood is SO GOOD! Love it. And shrimp might be the best of all. Love the parm in these — terrific idea. Thanks! Yum!! These shrimp look scrumptious!! 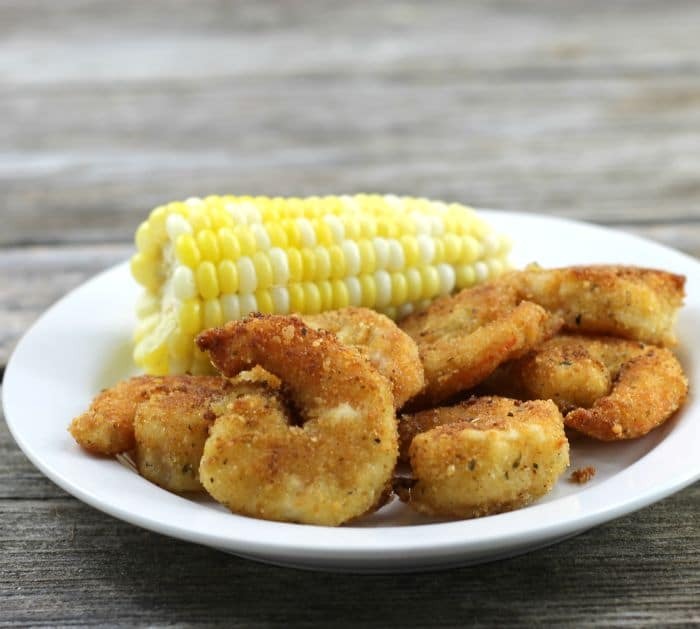 Fried shrimp is totally a comfort food for me…takes me back to my childhood growing up in Charleston, SC! I love the addition of parmesan here. These sound delicious, Dawn!